For some of you who may be visiting the first time, this is the sixty-fourth year that we have conducted these services, pre-Easter, downtown. Dr. Truett began them in a downtown theater sixty-four years ago. And as long as we had a downtown theater, they were conducted in those houses in the heart of our city. But when the theaters were destroyed and demolished about two years or so ago, we transferred them to this sanctuary. And since then, they have been conducted here in this beautiful and worshipful place. The theme of the messages this year is "God Speaks to America." And it was occasioned in my own heart by the tremendous crisis that America faces. In so many ways do we face that crisis. With our hostages in Tehran and Bogota, and in our confrontation with the nuclear and expansive power of Russia, and in the own policies of our government that bring great trepidation and unmitigated fear to many of our hearts; America needs a renascence. It needs a rebirth. It needs a visitation and an intervention from heaven. And that occasion is the theme for this year. This is the first time I have ever prepared addresses that were patriotic, but all five of them have been dedicated to the good of our country and the welfare of our nation. On Monday, the title was Is War In The Will Of God? On Tuesday: The Red In Our Flag Is Blood. On Wednesday: The Cancer That Consumes Us. Yesterday: Slavery Or Freedom? And the message today is kind of like a benedictory sermon. It is the concluding word of the week, entitled The Saving of the Nation. The first verse of the one hundred twenty-seventh Psalm, written by Solomon, is one that all of us have memorized from childhood: "Except the Lord build the house, they labor in vain that build it: except the Lord keep the city, the watchman waketh but in vain" [Psalm 127:1]. And another like meaningful and beautiful verse, in Psalm 33:12: "Blessed is the nation whose God is the Lord; and the people whom He hath chosen for His own inheritance." Thirty years ago, in 1950, for four months, I went around the world on a preaching mission in South America, in Africa, in Southern Europe, in the Middle East, in India, in Indonesia, in the Philippines, in Hong Kong, in Okinawa, in Japan, and finally, coming back to America. And after being gone four long arduous months, so well do I remember the emotion that welled up in my soul when in the early, but dark morning hour, the pilot announced over the P.A. system, "The next lights that you see on the left side of the plane will be the lights of America." Out of the desperation of the oppression of the centuries in the Old World and in the old country, the Pilgrims and our forefathers came to this New World seeking liberty, freedom, and a new and a more glorious life. And in searching for a bulwark against oppression and a guarantee for the rights and liberties of man, they sought models in the governments of the earth. Our founding fathers turned, first, to Spain and found in that nation, that the rights and liberties of man was guaranteed by a monarchy. "But," said our founding fathers, "if a monarchy can guarantee rights and liberties, that same monarchy can also take them away." Our founding fathers turned, next, to England and found that, in England, the rights and liberties of man were guaranteed by a Parliament. "But," said our founding fathers, "if a Parliament can guarantee rights and liberties, that same Parliament can take them away." They turned, next, to France and found that the rights and liberties of man were guaranteed by the will of a majority. "But," said our founding fathers, "if a majority can guarantee rights and liberties, that same majority can oppress a minority." It was then that our founding fathers looked upward to heaven and found, in the character and in the revelation and in the word of Almighty God, the safeguard for the rights and liberties of man and the bulwark against oppression. And they wrote it in their first great document: "It is by the creation of God, that we before Him and before the laws of justice are free and equal." And that tremendous commitment to the liberties and the freedom of man in our nation has been sustained through all of these years by a dependence upon God and a looking upward to heaven. When the Constitutional Convention was called, those thirteen colonies were hopelessly deadlocked. And it was then, after days and weeks of futile debate and discussion, that aged Ben Franklin stood up, made that immortal address that we could not hope to succeed, except in the blessing of Almighty God. Thereupon he made the motion that Congress, this Continental Congress, go to the Lord in prayer. And thereafter, each session was opened by the invocation of God’s blessing upon their discussion and debate and deliberations. When we think of George Washington, we think of his kneeling in the snows of Valley Forge, asking the Lord’s guidance and direction on the little shattered and battered and ragged Revolutionary Army. But we forget, that that same George Washington looked up to heaven for God’s guidance and blessing upon the infant republic. When a distinguished visitor from England came to America, and attending the session of the American Congress, asked the secretary of state, the Honorable Thompson, "Which one is Mr. Washington?" And the secretary of state replied, "When Congress goes to prayer, the one who kneels is George Washington." One of the most dramatic of all of the incidents in America history, to me, is in the fall of the Confederate Army of Virginia. And for the first time, after four years of terrible conflict, the president of the United States, Abraham Lincoln, walked into Richmond, the capital of the Confederacy. He did not ride in as a warrior, or in some public conveyance as a conqueror. He walked into the city, and as a plain citizen, went down through the streets. Anybody could have shot him from any window. He made his way to the State House, and into the office of the president of the Confederacy. And seated at the desk of Jefferson Davis, he bowed his head in prayer for the healing of the nation. He never lived to see that prayer answered. But today, Alabama and Georgia and Mississippi and Texas are as much a part of the Union as Connecticut and New York and Illinois, sustained by the importunity of these men of God, who asked the blessing of our Lord upon our nation. One of the poignant memories of my life is in recalling D-Day, in our last World War. Word was sent out that, when the message comes that our American men have stormed the very fortress of Hitler in continental Europe, that immediately all of us would gather in our churches, asking God’s blessing upon that tremendous and significant effort. I was pastor then, in 1940, in Muskogee, Oklahoma. And the word came, in about 2:00 o’clock in the morning, the word came that the men had landed on the beaches of Normandy. Immediately, I arose and dressed, and made my way down to the church for prayer and the blessing of God upon our men. And when I walked into the church, I could not believe my eyes. Muskogee has a beautiful First Baptist Church, a spacious one with a large horseshoe balcony in it, such as this old and sacred sanctuary. And when I walked into the church, it was filled, it was jammed, the lower floor from side to side, that balcony and people standing around the walls, at 2:00 o’clock in the morning. The prayers of so many people could not be denied. God blessed that effort and brought us once again freedom and liberty to our people. I cannot conceive of the world had Hitler won the war and had we been defeated. In Germany he imprisoned the pastors. He placed in prison camps those who called upon the name of the Lord. We wouldn’t be here today, had God not answered the prayers of those people. And my dear men and women, whether we live or die in the future lies in the imponderables of Almighty God. 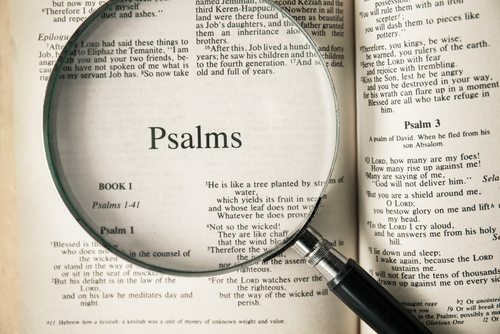 The Psalm that we read: "Except the Lord build the house, they labor in vain that build it: except the Lord keep the city, the watchman waketh but in vain" [Psalm 127:1]; all of our future, all of the destiny of the years that unfold before us, lie in the choice, and in the will, and in the purpose of Almighty God, and in no other area will that destiny be found. When we turn the pages of history, it is astonishing what we read in those chronicles. One of the great armies of the ancient world was Sennacherib’s. The Assyrian was a brutal and ruthless and terrible adversary. Under Sennacherib, who was a gifted soldier, they conquered the earth. And he shut up Jerusalem as a man would a city in a vise; sent a letter to Hezekiah, demanding his complete capitulation. That meant slavery and the destruction of the city [2 Kings 18:13-19:13]. And Hezekiah took the word of mandate for surrender, went into the house of the Lord, and laid it before God. And while he was on his knees before the Almighty, the prophet Isaiah was sent by the Lord, saying, "The battle is not yours, it is Mine" [2 Kings 19:14-34]. That night God sent one angel, who passed over the vast army of Sennacherib, and the next morning, the king of Nineveh counted 185,000, as the Bible calls it, dead corpses [2 Kings 19:35]. That’s God. All history reads just like that. In 1588, King Philip of Spain gathered the most invincible armada of ships the world, to that time, had ever seen, and he sent them to destroy England. And the Lord God called just one of His servants. He called one of His winds, and He said, "See it. Destroy it. Blow it on the rocks." And the Spanish Armada was destroyed by the hand of Almighty God. One of the most amazing of all of the developments I have ever read in history was at Waterloo; Napoleon – a genius, invincible; and on the other side, the Duke of Wellington, leading his English army. And when the battle was joined, Napoleon was not aware that before him was a sunken road. And when he gave the order for the cavalry to charge, those horses, coming to that sunken road, unaware, uncharted, unknown, those cavalrymen fell into that ditch, into that road! And the horses of the cavalry back of them stumbled over them. And the great surging throng back stumbled over them. And the whole effort of Napoleon lay prostrate there in an indescribable heap of men and soldiers. Who would ever thought for such a thing as that? That’s God, the imponderables of the Almighty God. Why didn’t Germany invent that atomic bomb? They were in a breath of it. They lacked a few days doing it. There have never been educational and academic achievements comparable to those German universities before World War II. The greatest scientists in the earth were in Germany. They were the ones who invented the "V" weapon that was destroying England. Why is it that Germany did not first discover the atomic bomb? I say, they were in moments of it. But, God held it back, gave it to America, by which and with which, we closed World War II, in triumph and in victory for our people. It is thus in all of the future of the strength of America. I close. When I was a boy, I declaimed. I one time won a silver loving cup for declaiming. A declamation is an address, a speech made by some famous statesman, and it is memorized and delivered by, say, a young fellow in high school, as I was. To me, the most moving of all of the addresses, declamations, that I ever heard, was from Henry W. Grady, who was editor of the Atlanta Constitution and one of the tremendous Christian statesmen of American life. And this, briefly, was it. Henry W. Grady was speaking on the greatness of America, and he said, "I have stood by Hampton Roads in Chesapeake Bay, and saw there, deployed the great naval strength of America. And then, on the shore, the parading might of our armies. And as I looked at the navy and as I looked at the army, I said, ‘Surely the strength of America is to be found in its military and naval might.’"
The great orator said later, he stood under the dome of the Capitol building in Washington, D.C. And as he watched the processes of democracy, he said, "Surely the greatness of America is to be found in its Senate, in its Congress, and in its legislative processes." Then, he said, "Sometime later, I was the guest in a Georgia home, in a farm of an old friend that I knew from boyhood days. And at the end of the day, when the work was done, he gathered his family around him, opened God’s Holy Word and, after reading from God’s Bible, the family knelt in prayer." And the great orator said, "As I knelt with my old friend and his family in the circle of that evening prayer, the great armies and navies of America faded away. The Capitol building with its Senate and its Congress faded away. And there came to my heart the conviction that the strength of America is found in its godly people." What was true in the days of that Southern statesman and orator is true today. God bless America! And I have asked our minister of music if he would close this week of pre-Easter services with all of our singing that humble prayer to the Lord, who guides and judges the destiny of all the nations of the earth. And this prayer in song will be our benediction.